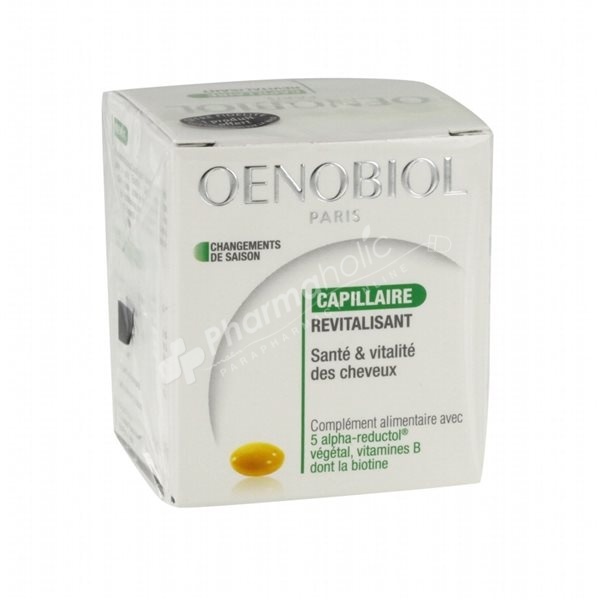 Oenobiol Hair restorer is an oral supplement designed to strengthen fragile hair due to stress, fatigue, unbalanced diet or hereditary factors in both men and in women. Its active ingredients act directly on the source of the problem, the hair root, effectively treating hair loss. Oenobiol Hair Restorer Supplements use the 5 alpha-reductol, an exclusive active element of natural origin to attack the enzyme in the bulb that is responsible for hair loss. 2 capsules per day, during a meal, in a 3-month course of treatment. 5 alpha-réductol ® plant extract, pumpkin seed oil (Cucurbita pepo), B vitamins: B1, B2, B3, B5, B6 and B8 . Within the framework of a varied and well-balanced food and of a healthy lifestyle. The persons under breast-feeding or pregnant medical supervision, the women have to ask advice from their doctor before taking a food complement.